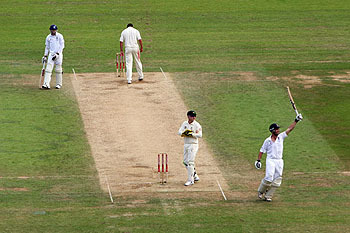 As long as I’m writing about British sporting clubs today, how about some cricket blogging? A few weeks ago I was emailing with Alex Massie about something or other, and along the way suggested that he should write more about cricket. And the rules! Every year or two, when some big test series comes along, I read up on the rules again and then immediately forget them. It’s sort of like quantum mechanics: no matter how often I read about it, my brain refuses to accept that anything so eccentric can possibly be true, and promptly expels it. This is  an aspect of cricket that mystifies many people, by no means all of them American. But of the three most common results — a win, a loss and a draw — it is not an overstatement to say that the draw is the most important. Because it is the draw, or more accurately the possibility of the draw, that gives the game its texture and much of its near-endless variety. Then he starts quoting Clausewitz. Someday, I suppose, I need to actually go watch some cricket in person with a knowledgable fan. Only then, like Schrödinger’s cat, will I truly understand what it’s all about.